An unusual combination of very strong wind shear and strong instability may lead to a powerful round of thunderstorms in the afternoon. 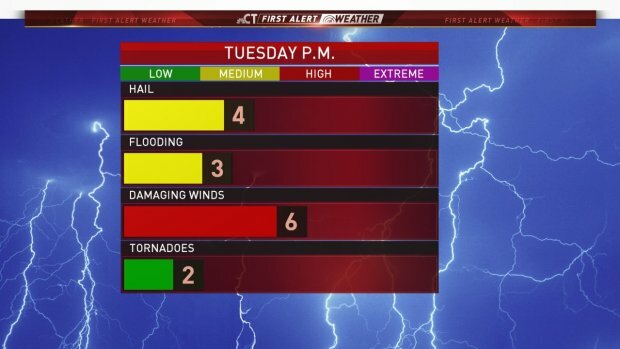 Something called an Elevated Mixed Layer (or EML) is expected to be overhead Tuesday afternoon and that tends to raise the stakes for severe weather - including large hail, damaging winds, and even tornadoes. Most of our major severe weather events have occurred with an EML present. Steep mid-level lapse rates on the order of 8C/km will setup overhead Tuesday afternoon. This means the temperature is dropping 8 degrees celsius every kilometer you go up in the atmosphere. This is a rapid decrease! We look for this signal about 10,000 to 20,000 feet above our heads. This can lead to some wicked instability and can help air parcels in thunderstorms accelerate rapidly as they hit the pocket of greatest instability above our heads. Additionally, we're expecting about 50 knots of deep layer wind shear. 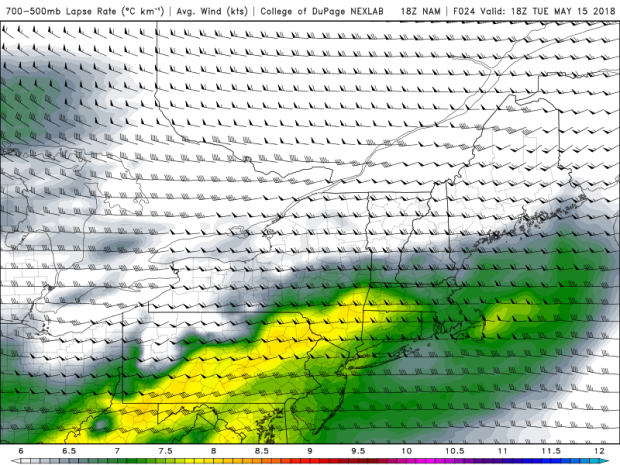 Wind shear is critical for thunderstorms to organize. Strong shear can result in well organized lines of storms that can effectively transport damaging winds to the ground. Strong shear is also critical for storms to begin rotating and can create supercells which increases the storm's updraft and also the potential for large hail. While some of our biggest severe weather days have featured an EML (think July, 1989 tornado outbreak, 1995 northeast derecho, etc.) it won't be hot or moist enough to result in weather that severe. Still, there is certainly an elevated risk for big hail, damaging winds, and even tornadoes. This is an unusual combination of factors we have so we need to be ready for unusually powerful storms. The storms will move into the state after 2 p.m. in the Northwest Hills and continue southeast from there. 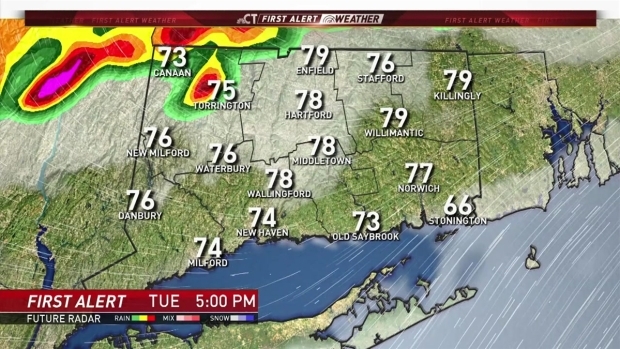 Normally, storms weaken quickly this time of year near the coast but given the steep lapse rates and EML these storms may have more longevity that unusual. While there is plenty of wind shear there isn't much directional shear - the wind speed increases rapidly with height but it doesn't change direction with height. Given that and the fact storms will likely organize in a line and not remain discrete any tornado activity should be isolated - though it is possible. We'll keep you posted tomorrow as the storm's approach Connecticut. While severe storms are a good bet - just how strong they are will come down to very small scale features that are a challenge to identify too far ahead of time.